A prominent painter in the Tuscan city of Siena at the beginning of the seventeenth century, Vanni executed several major altarpieces for the churches of his hometown. 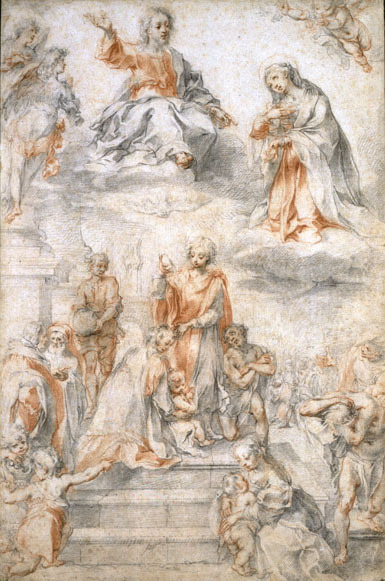 This drawing was made in preparation for his altarpiece for the Cathedral of Siena, a painting commissioned in 1593. Varying in some details from the final painting, which still stands in the cathedral, the study is quite finished in appearance. Its style and technique mark Vanni as a follower of Federico Barocci, a master from Urbino, who became famous for his work for the Medici, the powerful banking family in Florence, and for the pope in Rome. The legendary Ansano, who was born into a noble family in Siena in the fourth century, became an influential preacher of the Christian faith at the age of twelve. His father was loyal to the Roman emperor Diocletian, and after years of trying to control his rebellious son, he condemned Ansano to death when the saint was just twenty years old. The altarpiece represents Ansano as a pious youth baptizing the converted Christians. Christ is gloriously enthroned in heaven above, while the Virgin Mary intercedes for the Sienese.